Softball Against Cancer is a project that combines love for our sport with the power to help others. 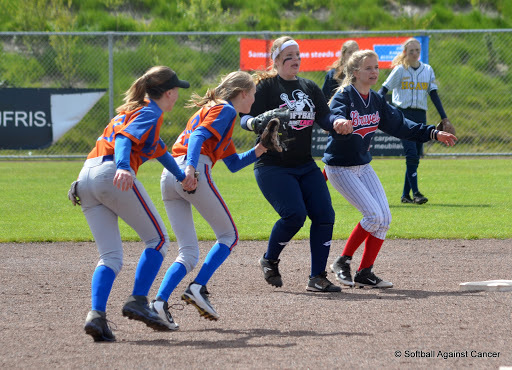 On May 3, the first Softball Against Cancer (SAC) Day was organized at the Hoofddorp Pioniers Stadium in the Netherlands. Ginger de Weert, a long-time Dutch national team pitcher, had been asked to work with Baseball Against Cancer (BAC), an organization founded four years ago by Swen Huijer, to establish a softball version of the event. The aim was to run a day-long series of softball clinic sessions, coached by some of the top players and coaches in the Netherlands, to raise money to support cancer research. After an opening pitch by Swen, the clinic sessions began. In the morning, the focus was on defense, while after lunch hitting, running and bunting was on the schedule. A day full of softball closed with a game. The instructors did a great job and had a great response from the players. As a result of the SAC Day, 3,500 euros was credited to the account of the Dutch cancer research foundation KWF. Swen Huijer has also organized a Baseball Against Cancer Day, a barbeque, and a Zumba event this year, and the total amount raised at the four events, including the Softball Against Cancer day, was 15,000 euros. To learn more about the Softball Against Cancer event, read our preview of the event here, visit the SAC website, or follow the SAC on Facebook, where you can also buy the SAC merchandise.